IDMA under the auspices of Quality Management & Technical Committee and Regulatory Affairs Committee is pleased to announce the Seminar on "Impurity Profile: Drug Substance, Excipients and Drug Product" Co-sponsored by Mr. B R S Rao of Chroma Chemie, Bangalore, on Tuesday, 23rd October 2018, at Hotel Radisson, Andheri (E), Mumbai. The Seminar will host eminent speakers from Regulatory and Government Institutions such as USFDA Delhi Office, WHO-India, EDQM and CDSCO. We have invited Dr. Eswara Reddy, DCG (I) to be our Chief Guest for this seminar. Impurity is defined as “Any component of a drug substance that is not the chemical entity defined as the drug substance and in addition, for a drug product, any component that is not a formulation ingredient”. Control of Impurities in the Pharmaceutical World is a Complicated Problem, both for Industry and Regulator. Drug Substance Impurities can be conveniently classified into 3 categories: Organic Impurities – ICH Q3A and M7, Inorganic Impurities – Q3D and Residual Solvents – Q3C. In considering the production of a drug product, there are broad categories of potential sources of impurities: Degradation products of the drug substance, Impurities that are potentially introduced into the drug substance and/or drug product from manufacturing equipment, Impurities that have the potential to be leached into the drug substance and drug product from container closure systems, and Reaction products of an excipient with the drug substance. A Drug Substance specification should include the following, where “specified impurity” is any impurity present at greater than the identification threshold: Each specified identified impurity, Each specified unidentified impurity, Any unspecified impurity with an acceptance criterion of not more than (≤) the identification threshold, and Total impurities. A Drug Product specification should include the following, where “specified impurity” is any impurity present at greater than the identification threshold: Each specified identified degradation product, Each specified unidentified degradation product, Any unspecified degradation product with an acceptance criterion of not more than (≤) the identification threshold, and Total degradation products. A properly developed control strategy for impurities in drug products must take all of these into account. 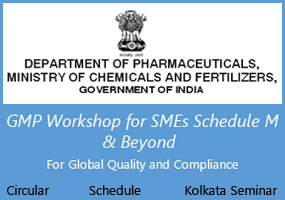 This will be a unique Seminar which will provide a practical insight on Impurities in Drug Substance, Excipients and Drug Product and why it is vital to business success by creating a culture of quality and achieving Quality Excellence across all the industry sectors – small, Medium and large companies alike. The detailed Agenda for the Seminar is attached.